Contains 18 Photoshop actions and 6 bonus actions to help you with the creation process. This pack will allow you to create realistic embroidery, sewing and stitching effects out of any text, shape, raster. The embroidery effects can easily be modified and customized after the action is ended. You can pick the color, fabric texture(leather, jeans, linen). And you can use one of the +40 stitch brushes included in this pack. I have also added a PSD bonus file containing a vector needle that you can use in your designs. The PSD also includes some samples made with the actions. The end result has the layers intact so that you can customize and edit the effect as you will see in the customization section. I added a PSD file “EMBROIDERY-SAMPLES” with samples of all the effects produced by the first 20 actions. Also I added 2 action that can be used to create the fill shape embroidery effect. Add your text/shape and play the “FULL EMBROIDERY” action. Use the “Fill shape with embroidery” action several times to fill your shape. You can leave the default brush or you can get creative and use other stitch brushes. make the effects look a little better. 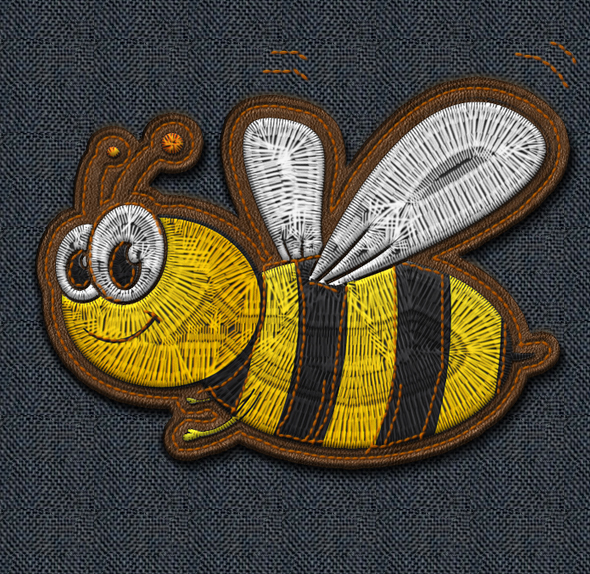 I have updated the ATN file and now you can create multi colored images with embroidered effect. See the sample below.